Emirates is boosting its commitment to key growth markets, with the confirmation the airline will launch four additional weekly flights to Cairo commencing 29 October. The four new flights will increase the number of frequencies between the two cities to three each day, and take the total number of weekly Emirates flights serving Cairo to 21. Similar to the current service between the two cities, the new flights will be operated by a 360-seat Boeing 777-300ER in a three-class configuration featuring 8 private suites, 42 Business Class and 310 Economy Class seats; adding 1,440 seats each way per week on the route. Meanwhile, an Emirates A380 aircraft landed at Colombo’s Bandaranaike International Airport (BIA) last week, helping Sri Lanka and the airport achieve an aviation milestone. Arranged to celebrate BIA’s recently resurfaced and upgraded runway, the special one-off A380 flight replaced the B777 aircraft usually deployed by Emirates on flights to Sri Lanka. The aircraft was on ground for more than six hours to enable airport executives, VIPs, trade partners and media to enjoy guided static tours of its cabins and unique amenities. “This one-off flight reflects the strong relationship we have with the market and our commitment to the destination. It signifies that, when demand for the destination grows, as it definitely will, to the point that scheduled A380 flights are feasible, Emirates will be ready to operate one,” said Emirates' Senior Vice President Commercial (West Asia & Indian Ocean) Ahmed Khoory. “For the BIA, this event signals that it is ‘A380 ready,’ ... Given the Sri Lanka government’s focus on developing tourism, this is an important development. 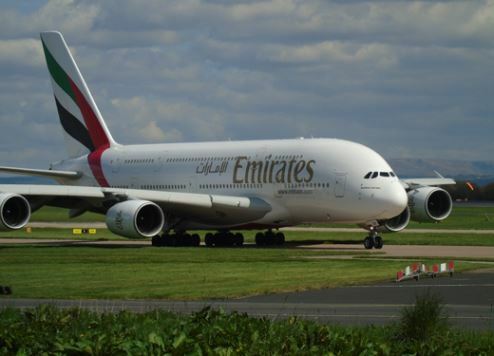 For local aviation enthusiasts it is a matter of pride that their airport has joined the ranks of leading international airports in the A380 league,” he added.